Lubor On Tech: Quo Vadis, RIM? Everybody is talking about RIM today and I simply have to comment. I have written several articles about RIM in the past. Over a year ago, I have suggested the 10 Reasons Why Microsoft Should Acquire RIM. A few months back, I have also wondered why does RIM keep chasing the consumers instead of focusing on their traditional strengths in the enterprise. RIM is the largest employer here in Waterloo, ON and so I do care. RIM is in trouble and there is no way to hide it. Having discovered the killer mobile app - email - a decade ago, RIM has completely missed the notion that we could use the BlackBerry for more things than just email. Apple entered the market back in 2007 and completely transformed it with some 400,000 apps available for the iPhone. The result is a dramatic loss in market share which is now inevitably followed by revenue shortfall. 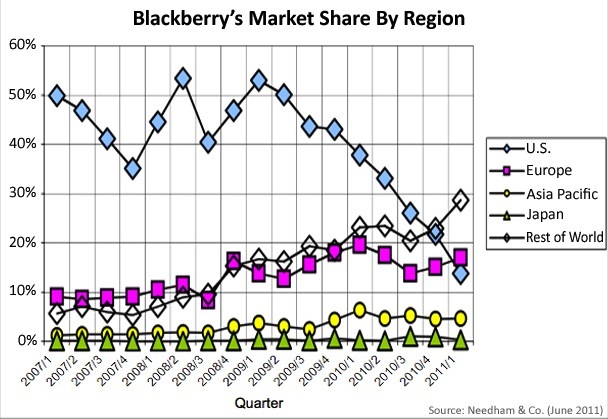 Here is RIM's problem: declining marketshare. In this ideal scenario, RIM will find a way to compete with compelling devices but that won't be enough. RIM will need to attract developers and get quickly to some 100,000 apps. That won't be easy since the developers have to divide their precious resources between supporting iOS, Android, RIM and now Microsoft and HP are also vying for their attention - and with much deeper pockets. And even the application support may not be enough. RIM will need to add some exclusive or at least unique and compelling content and services. The mobile battle ground is no longer about devices but entire eco-systems. Apple has got music and movies, Google has search and ads, and even Microsoft has the Xbox games. What will be RIM’s angle? My suggestion would be enterprise content and enterprise apps but that hasn’t been RIM’s focus lately. The voices suggesting that RIM will be acquired were loud yesterday. The Wall Street Journal even declared Microsoft the most likely suitor. While I suggested that a year ago, I don’t see that scenario as likely in the next 12 months. Microsoft is right now in a committed relationship with Nokia and that relationship would have to fail before Microsoft could pursue RIM with a straight face. And honestly, I don’t see that happening anytime soon. Microsoft built an awesome and differentiated mobile operating system and appears to be quite determined to make it a success. However, they still have to get those 100,000 apps - here they face the same challenge as RIM. There are, of course, other possible suitors who could be interested in RIM. Cisco could use it to boost its unified communications agenda - and to add some additional load on those routers. Oracle has surprisingly not articulated any mobile strategy so far and buying RIM would be a shot in the arm, particularly given Oracle’s laser focus on the enterprise. IBM has also been waiting on the sidelines and could use a mobile platform. And even Google could acquire RIM, swap the OS and use it as a foray into the enterprise market. And let’s not forget other big players in the IT market: Dell, Intel, Lenovo, etc. I just hope it’s not going to be Computer Associates or some cable company. The 3rd, least attractive scenario is a slow - or maybe not that slow - demise. Vicious cycle of falling market shares, declining revenues, and lay-offs could lead to RIM following in the footsteps of Palm. Sure, even Palm got eventually acquired by HP but at the time, Palm was already pretty much irrelevant. And if RIM doesn’t make some radical changes, this scenario could really happen. I sincerely hope it won’t come to a demise of RIM and that RIM turns things around. RIM is a great company and the world will be a better place with an independent player keeping the big vendors honest. Acquisition by the right company would not be a bad outcome either. I still believe that Microsoft would have been the best fit but as I explained above, this scenario is less likely now than it was when I have suggested it in April 2010. It sure will be interesting to watch this market play out. RIM's problem is not declining market share. It is declining market share in the US. You must start with that. Thanks for commenting, Bo. You are absolutely right about the market share challenge in the US. But with US being a significant portion of the global market, that decline hurts the overall big picture.